The surface of all metal parts contain some degree of micro-cracking, tiny cracks, discontinuities or even tool marks that can be a cause of eventual failure. When a metal part is stressed these micro-cracks enlarge and develop throughout the part and at some point in time the part will fail. High stress areas often occur where there are machine marks, scratches, corners or holes, fillets, keyways, or other changes and interruptions in the smooth surfaces of metal. Bead blasting produces a beneficial effect of improving the surface finish of cast, machined or rough surface components. Burnley Bead Blasting uses spherical glass beads for all glass peening work. As glass beads are spherical, they do not have a cutting action and will therefore remove contamination and finish surfaces without destroying critical working tolerances. Glass bead blasting prepares parts for assembly or for plating, anodizing, painting or coating as this method of cleaning is a way to remove all foreign matter from metal, such as scale, corrosion, paint, carbon and epoxy. 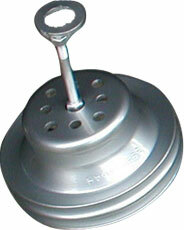 A freshly bead blasted surface is beautifully clean and has a slight sheen. It totally replaces brushing, grinding and chemical cleaning methods. Even more beneficially, complex items can be easily cleaned by glass bead impact blasting. Peening is not recommended for parts that are to be anodized and dyed. our shot Blasting Chamber is 4.5m length, 3m width by 2.3m height. 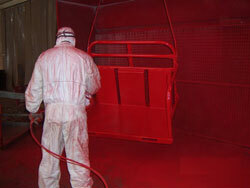 by a process known as Powder Coating.